Are you on the hunt for a rewarding opportunity in the food-service industry? Are you comfortable interacting with guests and working in a fast-paced, team environment? If so, we’d love to have you become a part of the Sunset Grill family! 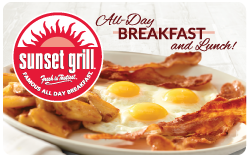 Sunset Grill is the perfect place to call your home away from home. Everyone has an important role to play when it comes to successfully operating a Sunset Grill restaurant. Our teams are tight-knit, and teamwork is the key to our success. Do you think you have what it takes? Apply now to become a Server, Line Cook, Prep Cook, Host, Busser, or Dishwasher today! We offer incredible hours (most of our restaurants close by 4 p.m.), tasty perks, and generous compensation packages. We can’t wait to meet you. 3604 Major MacKenzie Dr. W.